﻿A full range of Powertex Workshops are available at Bag End Studios in Highgate Hill by Certified Powertex Trainer Natalie Parish. This is our most popular workshop and fabulous for beginners. You have a choice of a wide range of heads to choose from and every statue is unique. 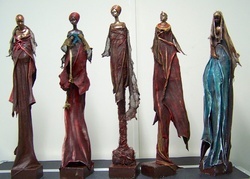 It is a great workshop to beginning experimenting with powertex fabric hardener and developing skills and ideas for other projects such garden statues, birds, home decor. ​I am excited to offer this NEW European workshop. This stunning figure, originally designed and created by Brigitte Grade (Belgium), is fabulous for beginners or those looking to upgrade their skills with Powertex. Already our most popular workshop and fabulous for beginners. You have a choice of a wide range of heads to choose from and every statue is unique. The results will amaze you and astound your friends! Above: Seated Figure by Sue Taylor, QLD - Certified Powertex Trainer - Ipswich. 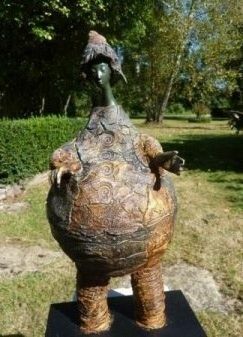 Create a Stunning Figurine with Powertex, Stone Art & Wire. This is a great workshop for participants with previous experience using Powertex who are looking to extend their knowledge of the medium. 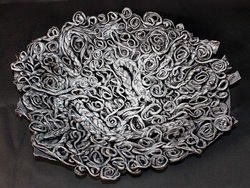 Using wine bottle bases discover the use of powertex as a versatile medium for recycled art. Learn how to build form and fabric wrap. Time: 5-8 hours depending on design. Cost: $100 includes tuition and all materials. Learn how to harden fabric over a mould with Powertex Fabric Hardener in this fabulous workshop! Great for those who want to explore other applications & techniques for textiles!!! Create TWO gorgeous mixed media plaques using Powertext. Great for tweens and teenager parties and school holidays. 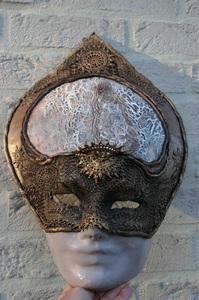 Use a mask to create your own fabulous artwork using Powertex ...a shorter workshop alternative for mask lovers! Use a mask to create your own fabulous artwork using Powertex and stone art.! This a great workshop for learning how to create form and how to use our new 3D Flex product as a clay with stunning textural effects. A very popular workshop with a resulting wow factor.